The Volunteer Program at Chandigarh has been suspended indefinitely. Please see HERE for more information. 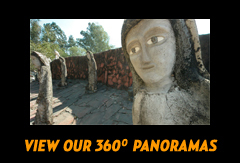 by Tacey Shough Feb 20th to March 18th, 2012 The very first thing I did on arrival at the Rock Garden, was meet Nek Chand. Like a starstruck teenager, I handed him a small gift of my work and was lost for words. I was psychologically unprepared for this immediate introduction and after a couple of polite questions and an uncomfortable silence, he rang a little bell. It felt like that was it.. my time was up..I'd had my chance to say something profound and I blew it! I was handed over to Ramchander; Mr Chand's driver, who seemed to think that the mere fact I existed was hilarious. He took me around to the guest house where I met up with John, another volunteer who got me up to scratch on his last week's stay there. The accommodation was very comfortable with me sharing a room with a bathroom with hot running water. As more volunteers were yet to arrive, I chose to spend my first day acquainting myself with the place whilst clearing litter. Nothing had prepared me for the huge scale of The Rock Garden; It took me all day to pick my way around the visiting area, and there were still parts I had overlooked. All my uncertainties about my Indian adventure vanished completely as I realised that if I had made the trip to see only the Rock Garden, it would have been worthwhile. Photographs never show the true wonders of art environments; as so often, the beauty is in the detail. The waterfalls and landscaping were as stunning as the vast collections of mosaiced figures and animals. Ingenious wall coverings, fencing and decoration were a treat to the discerning eye. Arrival at the most recent phase, once you feel you are reaching the end of the journey, simply takes your breath away. A blight on the surface of all this wonder, is litter. I spent hours clearing rubbish that first day and only scratched the surface. To my horror, I was later to discover that the litter collected in the bins..of which there must be tonnes each year...is simply thrown over the wall into the surrounding forest. The following day I joined John in a lesson in 3-D mosaicing. John had spent the previous few days constructing soldier figures out of cement, and now it was time to cover them. A young worker called Roudel was to be our teacher for this task, though he seemed uneasy in this role and when his superior arrived to inspect our work, it appeared that Roudel was as much the student as we were. Mosaicing a cement leg is a lot more difficult than it looks, and progress was very slow. Tile cutting tools were in short supply; so that limited our progress as well, despite Ranjhit, another of our mentors, showing us a technique of breaking a neat line with a trowel against your hand. This technique took some mastering, resulting in lots of broken shards and very sore hands. He also showed us a complete set of sculpting tools he had made himself from metal reinforcing bar. We were sent a variety of different teachers, all of whom had their own unique style of working and standard of tile laying... our work was slow and never quite seemed good enough. The discovery of an entire army of identical soldier figures awaiting installation in the next phase was the most useful learning curve. We decided to stop being so worried about how each individual figure looked as only a really awful mistake would show up amongst the crowd. After mosaicing the sculptures for a week, John and I joined forces in creating a set of info signs for the Garden. 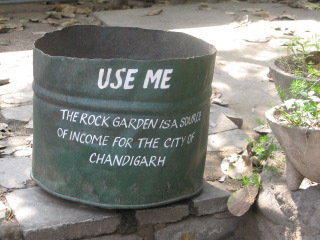 John had wanted to provide foreign visitors with more info on Nek Chand and the story behind the Rock Garden. As I had experience in sign-writing we decided to convey the information on large boards spread throughout the Garden. 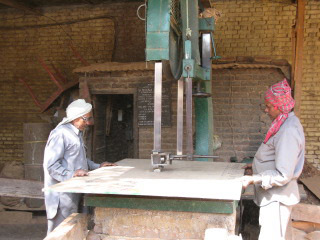 John composed the words for the boards, under the sub topics of History, Technical Innovation, Ecology, Chand and Chandigarh, International Collections, Sculpture, Future Plans and Facts and Figures. We decided the signs should be attractive but not fancy, so designed them to match health and safety notices around the Garden. Sourcing materials took time but it was very interesting to visit the timber yards in the industrial sector of Chandigarh. I chose to write different facts and figures on the dustbins all over the Garden, causing a lot of curiosity amongst the visitors. Whether litter picking, cleaning graffiti or painting, working in the park always created a lot of attention, and made work progress quite slow as one had to stop for endless chats and photos. In addition to the practical work- and perhaps more important, was our role as western ambassadors for Nek Chand and the Rock Garden. We were interviewed by a number of local newspapers and, on a visit to a tragically destroyed Rock Garden in a neighbouring town, Shifa, John and I were filmed for an item for a local tv channel. Shifa is a local Chandigarh volunteer, who explained to the cameras that Nek Chand is internationally respected, and the Indian people should value his legacy for generations to come. It was great having Shifa around, contrary to popular belief, not many Indian people speak English so to have a Hindi speaker in our midst was invaluable. 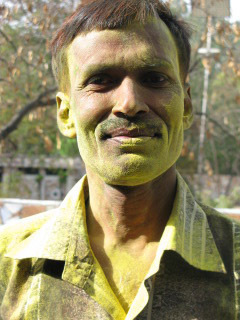 It also meant that we got to savour her mom's fantastic cooking and experience holi- the festival where people throw coloured powders at each other- from the inside! For one, we were on our best behaviour whilst the latter involved stuffing colours down tshirts and being drowned in buckets of water. 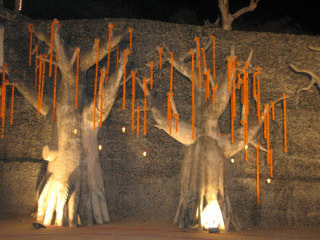 We attended several weddings that had hired the Rock Garden as a venue. We got to savour the very best in Indian cuisine, fresh fruits, music and dancing. To see the ladies dressed in their finery was also a treat. The Rock Garden looked even more splendid, draped and lit up in an array of colours. The Rock Garden is surrounded by jungle to the rear, and because of this our stay was decorated by peacocks strutting, parakeets squawking and grey hornbills, kites, buzzards, sunbirds and monkeys. A large Sambar deer also strayed into the park one day. A walk around the high walkway not yet open to the public was a bird watcher's haven early in the morning. The Rock Garden was not without issues; John and I came across 4 porcupines in a very small cage one morning. Porcupines are eaten in India, and apparently the meat is like rich pork. It was difficult to ascertain whether these 4 were to be eaten and for how long they had been like this. The issue was brought up with Nek Chand by several concerned parties, and just before I left he promised me someone would be coming to take them to a place where they could be better housed. The amount of rubbish generated by the Garden was also a huge issue for me. On holiday, the park hosted a rain dance party where food was served on polystyrene trays...all of which appeared over the wall amongst the trees the following day. The Garden has 5000 visitors a day and I wouldn't like to calculate how much rubbish is actually encroaching on the forest. Rubbish disposal is a National problem, and to tackle it at the Rock Garden, one would first have to locate the 'funding department': I was constantly baffled by the financial situation there; a lot of money was going in but where it was going, and who was managing this was a mystery. Nek Chand who oversees all the work at the Rock Garden has nothing to do with finance. 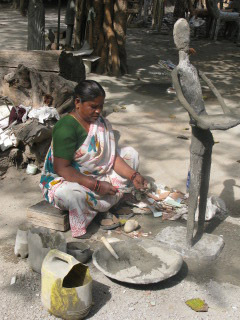 There is a huge workforce at The Rock Garden, many who live there in basic hut like accommodation. It would be nice though if they were better equipped and that for instance there were more than one saw, hammer or tape measure to go around! These slight quibbles did nothing to take away any of the richness of my experience. 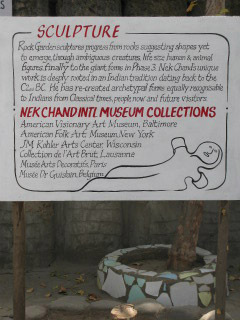 I am eternally grateful to have been a part of Nek Chand's fantastic vision albeit for a very short time. The community of people that is The Rock Garden went out of their way to make our stay delightful; my accommodation was clean and comfortable; the food was fantastic and catered to my vegan diet without a question and the staff were constantly entertaining. I would recommend it as an experience for anybody interested in a creative cultural exchange. Expect to drink a lot of tea! I completed my stay in India by giving talks about the Rock Garden to classes at a Himalayan school. We followed the talks by making sculptures from rubbish. The children were enthralled by the idea of creating something from nothing. May the Rock Garden be a lesson to us all.